This post is brought to you by Kamikoto Knives. I love things served in bowls. Now, I know this has been a bit of a trend, at least here in the US, but my love for bowls goes way back. This is probably why I love Japanese donburi so much. A donburi, put simply, is a Japanese rice bowl. A large bowl of hot steamed Japanese rice topped with meat, fish, egg, or vegetables, garnishes, and sometimes condiments, and usually finished off with a few spoonfuls of the sauce/broth that the toppings were cooked in to soak down into the rice. I’ve shared a few donburi recipes before, like the very traditional oyakodon (chicken and egg rice bowl) and not so traditional pulled pork and roasted tomato donburi. When Kamikoto Knives contacted me, asking if I would be interested in trying out some of their knives, I immediately agreed. I had been craving a good donburi, so when I received the knives and opened them up, all I could think about was what was I going to make to put on top of rice! I knew that I wanted to make something with lots of vegetables, because nothing puts knives to the test like prepping a bunch of vegetables. 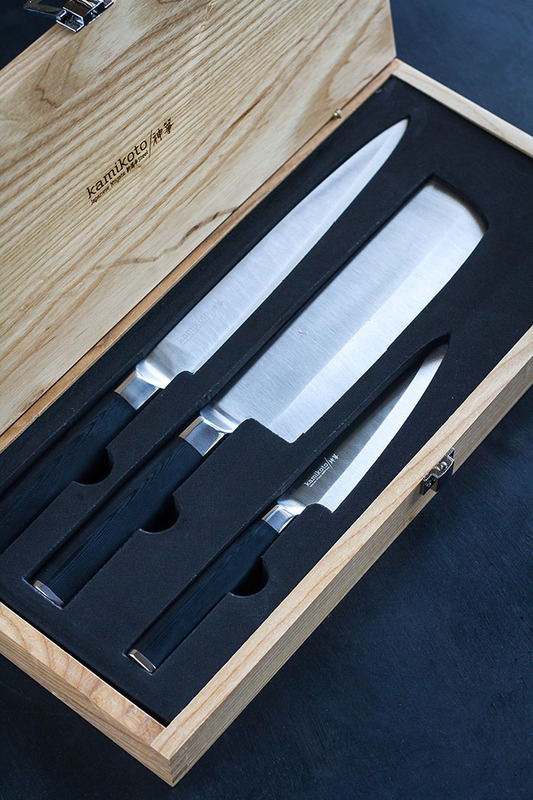 Kamikoto sent me their Kanpeki knife set, which includes a vegetable knife, a slicing knife, and a utility knife and come in an ash wood storage box I have tried out a lot of knives over the years, but these take the cake. These knives are true Japanese knives. A lot of the Japanese knives that are marketed in the use are sharped in the western style, not the Japanese style. That is not the case with Kamikoto knives. A Japanese knife, unlike a western knife, is typically sharped on one side, the front facing side, and at a 15-degree angle, instead of the range of 18 to 28-degree angles used in Western knives. This makes for very sharp knives. Japanese knives are also typically made using harder steel, which means they hold their sharp edge longer. Not only does this make for a wonderful, efficient helper in the kitchen, but it also preserves the integrity of your food better! When you are chopping up things like burdock root, which are more fibrous and tend to discolor, this is extra important. So to test out these knives I grabbed some burdock root (gobo in Japanese), some Japanese sweet potato, and some carrots. I used the vegetable knife to do most of the work. 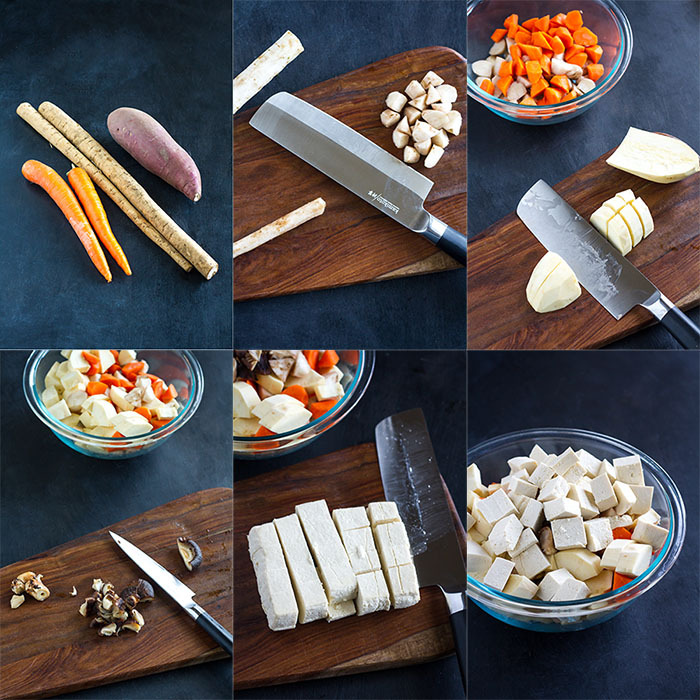 A Japanese vegetable knife is very different from a Western chef’s knife. It has a rectangular blade and the end is almost completely squared off. If you’ve never used one, you are missing out! They make very clean and precise cuts, making breaking down vegetables a blast. A cut the burdock root and carrots into small, uniform-sized pieces using a Japanese cut called rangiri, where you start with slicing through the end of the vegetable at a 45-degree angle, then turn the vegetable a 1/3 turn towards you and make another cut, keeping your knife at the same 45-degree angle. You continue doing this all the way to the other end. This helps maintain an even size, but also gives more cut surfaces to eat piece, which exposes more of each piece to the cooking liquid and results in more flavor! I cut the Japanese sweet potato into quarters, lengthwise, then cut the quarters, crosswise, into 1/2-inch thick slices. In addition to the vegetables I added some cubes of tofu. 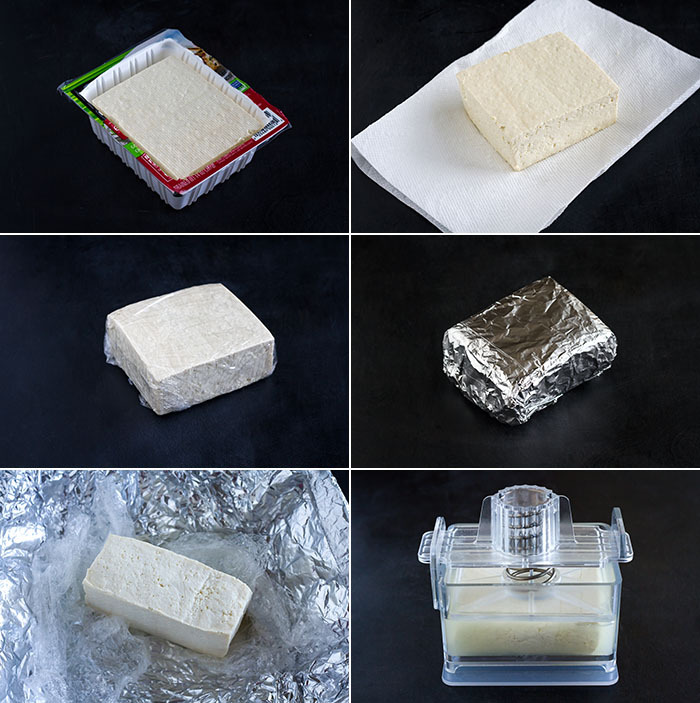 I started with extra-firm tofu that I drained, wrapped in a layer of plastic wrap, then in a layer of aluminum foil, and put in the freezer to freeze for 24 hours. After 24 hours I moved the tofu to the fridge to thaw and once it had thawed completely I put it in a tofu press for several hours to remove as much of the moisture as possible. Don’t worry if you don’t have a press, it’s a nonessential! I have included directions on how to press tofu without one in the recipe below. Why freeze the tofu? Freezing actually changes the cellular structure of the tofu, making it spongier and a bit more chewy. Why press the tofu? Pressing removes water which can then be replaced by more flavorful liquid. After all the veggies were prepped I cooked them in a combination of dashi (I used my kombu shiitake dashi recipe), reduced sodium tamari, and mirin. I also saved the shiitake mushrooms that I used to make the dashi, removed the stems and cut them into pieces and included them along with the vegetables. I simmered everything in the dashi mixture until the vegetables were tender. While the veggies were cooking I thinly sliced some green onions . . . which is another item where a good knife is critical. Who hasn’t had the experience of cutting a green onion and then having half of the slices be incomplete so they stick together? When the vegetables were tender I threw in some shelled edamame for some extra color and texture. Then it was time to eat! I scooped hot steamed Japanese rice into donburi bowls (you can use deep soup bowls too! ), then covered the rice with the simmered vegetables, and garnished the bowls with the thinly sliced green onions and toasted sesame seeds. At the risk of sounding cocky, you need this dish in your life. It is delicious comfort food and it’s good for you! That’s a win in my book. Even better? This tastes just as good the next day, if not better. As far as the knives go, they are the stuff that dreams are made of. Well-balanced and comfortable to hold and use for extended periods of time and they slice through things like you’re cutting through butter. These knives are also tools that, if cared for correctly, you could pass on to your grandchildren. They are definitely more expensive than most knives you might see, but you are paying for something that will last and serve you well. 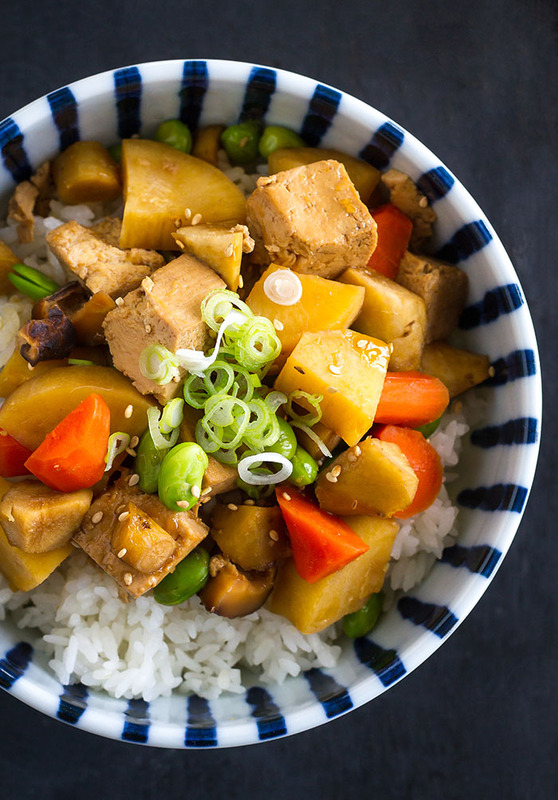 This donburi (Japanese rice bowl) takes some chopping, but once the prep is done it comes together quickly and easily. Just be sure to start about 3 days in advance prepping the tofu so it is ready when you need it. Also, when you make your dashi (stock) to use in making the tofu and vegetable topping, be sure to save the shiitake mushrooms once the dashi is done because you will be using them in the topping! Drain the tofu and pat it dry with a paper towel. Wrap in a layer of plastic wrap and then a layer of aluminum foil. Freeze in the freezer for 24 hours. Thaw in the refrigerator. Do not unwrap the tofu, but do place it, wrapped, in a container, as it may leak liquid. Thawing may take up to 2 days. When the tofu has thawed completely, unwrap it and shake off the excess liquid, then place it on a large plate lined with several layers of paper towel. Put several more layers of paper towel on top, then place a cutting board on top of that. Weight the cutting board down with something like several cans of food or a book and let the tofu press for at least 30 minutes (preferably several hours). 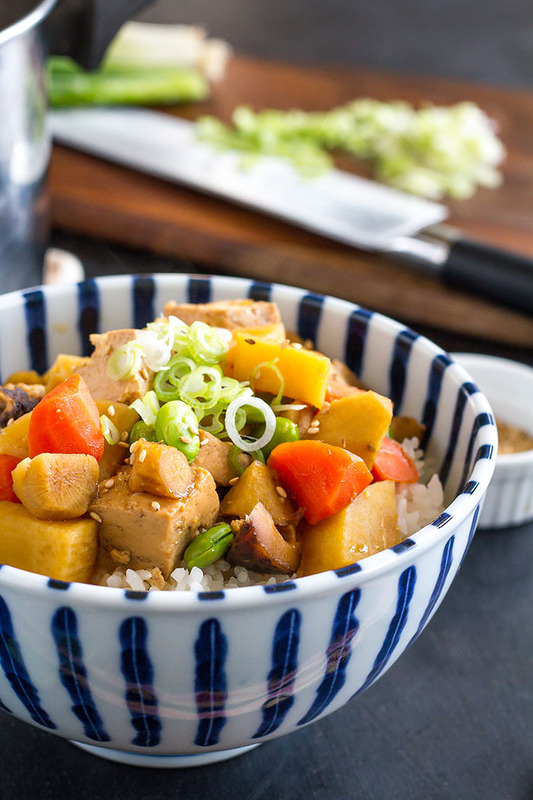 Once the tofu has been pressed, cut it into small cubes and set it aside. Put the frozen, shelled edamame in a pot and cover them with water. Bring the water to a boil over medium-high heat, then remove the pot from the heat and drain the water. Set the thawed edamame aside. Scrape off the outside layer of the burdock root using the back of a chef's knife, then cut it. 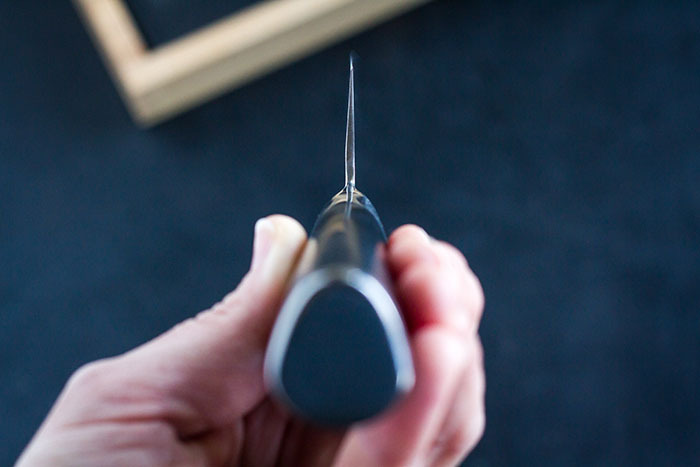 Start at the thicker end and cut it crosswise, with the knife at a 45-degree angle, about 1/2-inch from the end. Keeping the knife pointing in the same 45-degree angle, roll the burdock root toward you, about 1/3 turn, and slice again. Continue cutting this way, adjusting the length and angle of you cuts as needed to produce small chunks. Cut the peeled carrots using the same method. (This is the Japanese rangiri cut.) Cut the peeled Japanese sweet potato in half lengthwise, then cut each half in half again lengthwise. Cut each quarter crosswise into 1/2-inch thick slices. Combine the dashi, reduced sodium tamari, mirin, and ginger juice in a medium-sized saucepan. Bring to a gentle boil over medium heat. 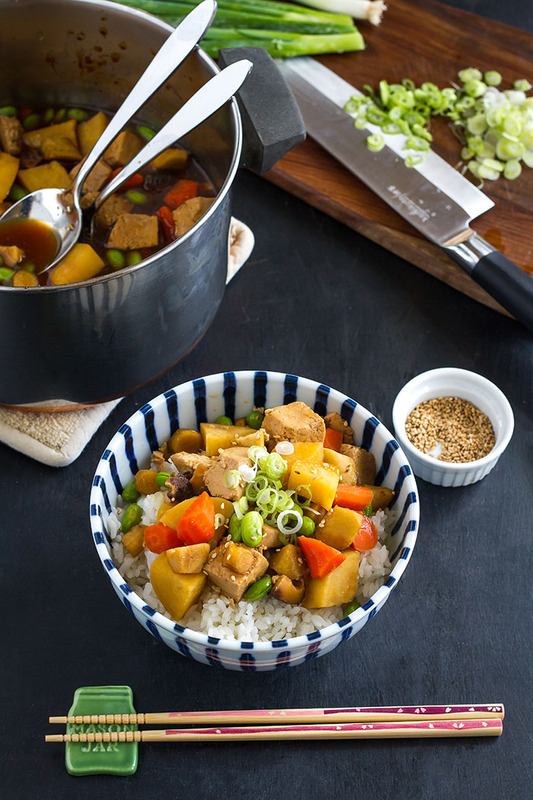 Add the tofu, carrots, burdock root, Japanese sweet potato, and mushroom pieces and simmer, uncovered, until all of the vegetables are tender. Reduce the heat as needed to maintain a gentle simmer as you are cooking the vegetables. Add the edamame and cook for an additional minute, allowing them to reheat and absorb the flavors in the saucepan. To assemble the rice bowls, put 1 1/2 to 2 cups of hot rice into individual donburi bowls or large deep soup bowls. Cover the rice with the tofu and vegetables. Spoon a few tablespoons of cooking liquid over each bowl. Garnish with thinly sliced green onion and toasted sesame seeds and serve immediately. If you cannot find burdock root, you can substitute 2 parsnips. To make ginger juice, finely grate several tablespoons of ginger, then put it in several layers of cheesecloth, or a tea bag, and twist to squeeze out the juice. You can also just use freshly grated ginger, but then you will have the fibers from the ginger as well. It's up to you! *Disclosure: Kamikoto sent me the Kanpeki knife set at no cost to me so that I could write a recipe post for them, using their knives. I received no other compensation. All experiences and opinions are my own! Those knives look amazing. I didn’t know that about the difference of Japanese knives and that vegetable knife is really cool looking. I just printed off this recipe! Thanks for always teaching us so much Rachel! They are amazing! Let me know if you make the rice bowl! I am so excited! I didn’t know you could make a plant-based dashi! P.S. This looks so GOOD! Yes, and it’s so easy too! Thanks Jenn! I made this tonight; mine wasn’t vegan because I used a packet of hondashi instead of the kombu dashi. It was my first time prepping tofu this way and I couldn’t believe how flavorful the tofu was – it really sucked up the sauce and was moist and tasty. A simple, perfect meal for a fall evening. I will definitely make this again – next time I’ll try the kombu dashi. I made it as the recipe directions indicated; I added small Japanese mushrooms, about 6 inches sliced daikon radish and a small can of water chestnuts. It was delicious!